This bench comes with 6 removable pegs which fit into six holes. The pegs can be hammered through the holes to the other side and then the bench turned over and the pegs hammered back again. The pegs are held in place with rubber inserts so there is some resistance when they are hammered. The pegs can also be pushed through by hand if your little one is a bit small for a hammer. 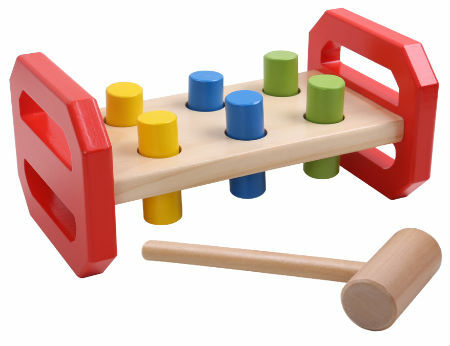 This is a very well designed and strong version of this toy with just the right amount of resistance when the pegs are pushed through. Size: 25cm long x 10cm high x 12 cm wide Hammer is 16cm long. We like this because: "Very strong and beautifully simple."